Mahogany Folding Bed Tray with Adjustable Rasier. I have upcoming knee replacement surgery scheduled and I needed a nice bed tray for eating and using the laptop during recovery. I had a beautiful piece of African Mahogany in the shop left over from a recent cabinet project and I couldn’t think of a better project to use it for. Mahogany is pretty pricey, but it is a pleasure to work. Milling, shaping, joining and finishing is a dream with this wood. The piece was pretty straight forward and I didn’t have any real plan. I sat on my bed and took a few measurements with a tape measure and just started in. I wanted it to be able to fold away after use for storage so I made the legs collapsable. I wanted the larger section to be able to raise up to different heights for reading and such. And I wanted it nice to look at and sturdy. I think I accomplished all these things. 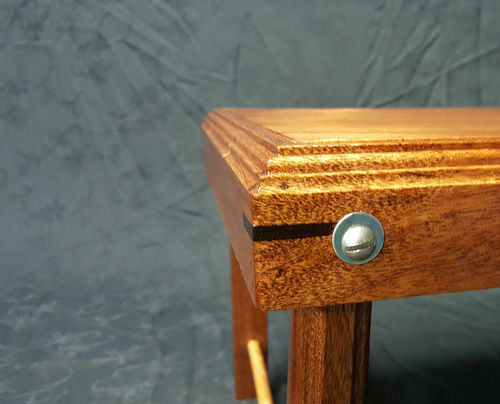 As the build was nearing completion, I had to use a round-over bit to soften the edges of the top, and just goofing around, I dug out a few of my ornamental profiling bits and gave the sides, legs, and raiser the treatment as well. The finish consisted of Linseed Oil and water based Polyurethane. Rubbed out real well and a coat of wax applied. This is a LOT nicer than the cheap pine ones I was looking at buying on-line. Here a couple detail shots. Nicely thought out and beautifully crafted. Your tray table looks great! I really like the extra detailing with the routed edges. I hope it will make your recovery a little more tolerable. Just today I came across some photos of my brother holding the one I made him a few years ago. I blogged about it here. Very nice work and craftsmanship on this, and the split top design is a great idea, really makes this tray versitile and multi-functional. Great idea on this design. 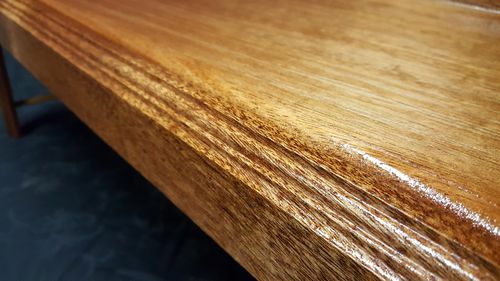 Nice looking splines on the corners, I like the color contrast, and the many molding features make this tray a true unique item. Great work. Good luck on the knee surgery, take it easy …. Nice work on your well thought out Bed Tray Eric! And good luck on your surgery and hope your recovery goes as expected. Another nice one, in fact excellent. Nice design, should be handy. You did a very nice job on this bed tray. It’s very creative and practical. Hope you don’t have to use it too long. Beautiful tray Eric. Let the wood speak, as they say. You got it right. While recovering from your surgery, you’ll will have a beautiful tray to look at and foresee your next project. Nice tray Eric (It’s a beauty ) which will be a nice platform for you while recovering and you will be glad you made it ahead of time . I wish you a speedy recovery as they always take too long for once liking . Looks good, looks functional, and pretty darn clever to boot. Fun project, I bet. Didn’t they make things like that in the 17th and 18th century for writing and reading? Seems like I saw a picture of one that was quite old. Hope that knee works well for you. That is one of the less predictable joints to replace. Make sure you do your physical therapy as directed. My wife had a shoulder rotator cuff surgery recently, and the recovery, although slow, is going without a hitch. She got back to work quickly, but is still gaining range of motion. First, I am relegated to making two quilting ironing board tops, and then a stand of some sort for one of them. Sherie’s friend gets the simple one because that is what she needs. These are 60”x24” items that are a little unwieldy. I have them cut out and now I am putting in a series of steam vent holes in each. Using birch plywood. Then my second task, although more interesting in some ways, has a budget parameter. A pine dining room table that will be painted, 6 feet by 3.5 feet. Using pre-turned legs from HD. It also has a time parameter, so I will have to get at it soon. It will go into a new condominium for our handicapped daughter (my stepdaughter). It will be used by two handicapped clients and a bunch of caregivers. Cheap and rugged is the object. Then I need to build a sturdy entryway bench, with a back to protect the wall, probably with underneath boot storage. Again, on a budget, and expected to be abused a little. Cheap and rugged again. So a few rather utilitarian objects. There will be some room for design, and I planned to put the router to use like you did. Great bed table. I remember one of those when I was growing up. Good luck on the knee replacement. That looks really great. 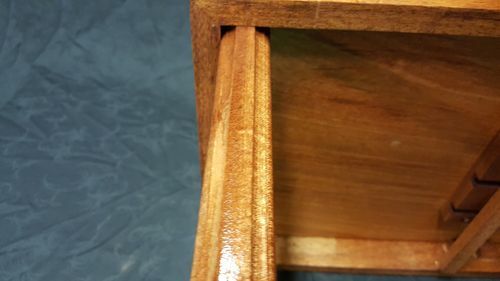 I love the look of African mahogany, but I think it’s difficult to work with… so soft and likes to warp after every cut.